Today is Purim. Many of us listened to the reading of Megillat Esther last night in synagogues of all denominatioins and in many locations. Today the Megillah is read once again and the day features sharing of food items with friends (Mishloach Manot) and gifts to the poor (Matanot L'Evionim). On Shabbat, the day before Purim, Rabbi Diana Fersko of the Stephen Wise Free Synagogue delivered a sermon that included reflections on Jewish humor in general, and the role of humor on Purim. 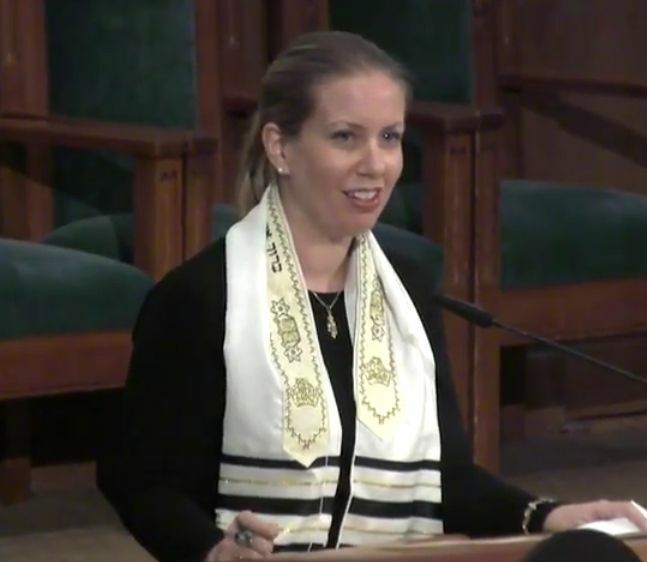 Rabbi Fersko received her ordination from Hebrew Union College – Jewish Institute of Religion in New York City where she was the recipient of numerous awards for academic excellence. She also holds a master’s degree in Hebrew Literature. During the short sermon, she tells a few old and familiar Jewish jokes, and advises to spend Purim emoting, singing, clapping, and laughing. She notes that the Talmud says that God himself dedicates specific time each day to laughter and joy, and encourages us to follow that example. Her comparing Breitbart to a Nazi newspaper is offensive, trivializes the Holocaust, and is outright wrong. Tevi Troy, a Jew placed very high in the Trump administration, wrote in the Wall St Journal earlier this week on how wrong her analogy is. She should read it. as they were in November. "I met the author of this article in a Maryland shul a few years ago. His Purim Shpiel advice is right on target. So are most of the 52 comments on his WSJ column. And to lighten up with more Purim fun, check out the Purim Edition of The Kustanowitz Kronikle at www.kustanowitz.com/kronpu17.pdf and at www.jewishhumorcentral.com. Chag sameach to all!" She is very well spoken, a nice smile while delivering her message. Did she mean to write a "Purim Shpiel" ? In which case it should be approved by everyone. We are so lucky to live in a free country where we can all voice our opinion. Second best to our homeland: Israel. DIDN'T ENJOY THIS AT ALL.....NO CHARISMA, BORING VOICE, GLAD I DON'T HAVE TO LISTEN TO HER.